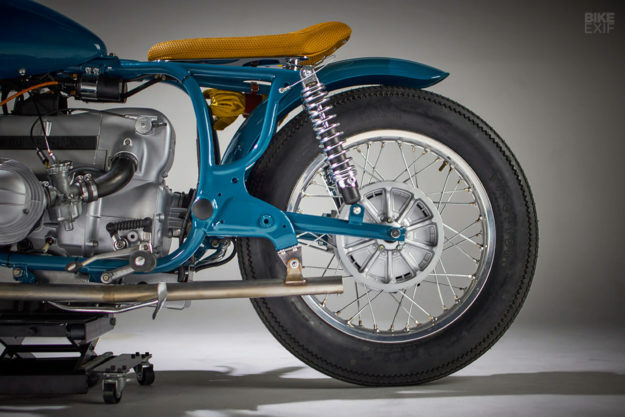 Classic BMW boxers are still über-popular as custom donors—but there’s a downside. 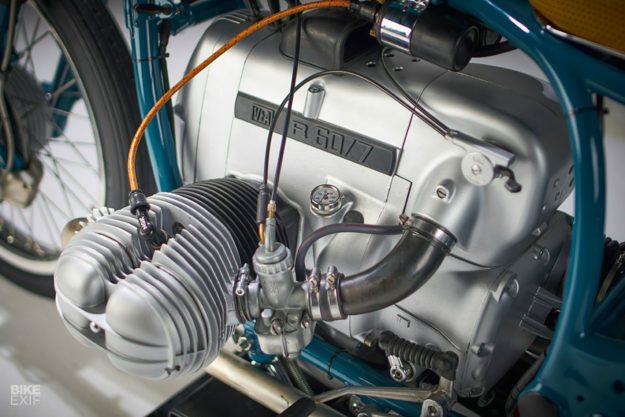 As we’ve seen with the Honda CB750 and the Harley-Davidson Sportster, airhead Beemer builds are all starting to look the same. So what does it take to build something fresh—without going overboard? 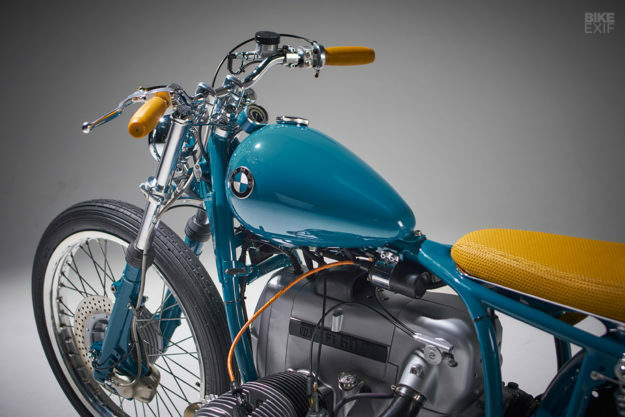 You need a client and a builder who are both tired of the me-too BMWs flooding the market, and have a taste for classic beauty. 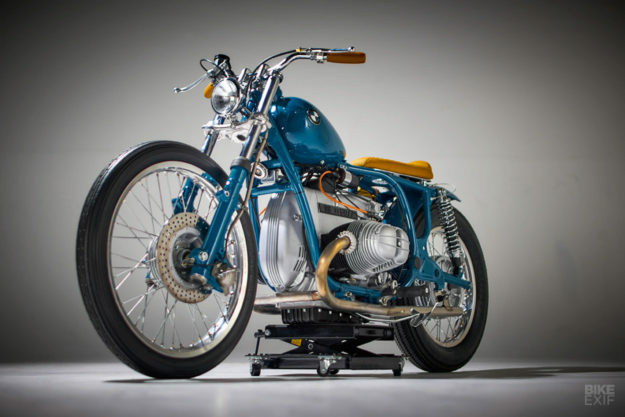 Then you have a winner, like this elegant R60 from Vintage Addiction Motorcycles. 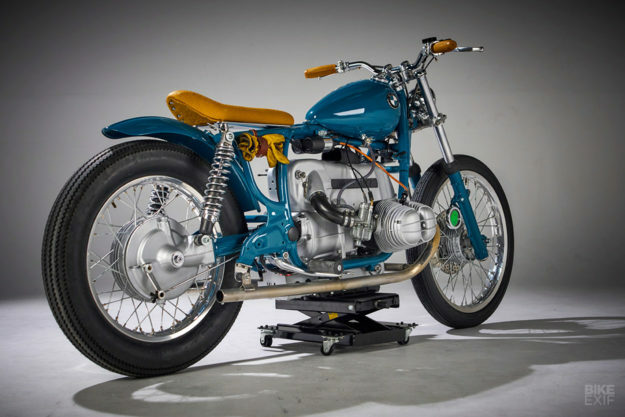 This dapper 1978 R60/7 belongs to a gentleman who collects vintage BMWs, but wanted something ‘alternative’ in his garage. And the Spanish workshop was happy to oblige. The donor bike was in pretty good nick, having been well maintained its entire life. Still, Carlos cracked open the motor and refurbished it with new seals, piston rings and bearings. The valves were lapped too, and new valve seats installed. And the transmission and carbs were overhauled, bringing the whole setup up to standard. Carlos started from scratch with the electrics though. Everything now runs off a Motogadget control unit, allowing for a mega-clean wiring loom and increasing reliability exponentially. 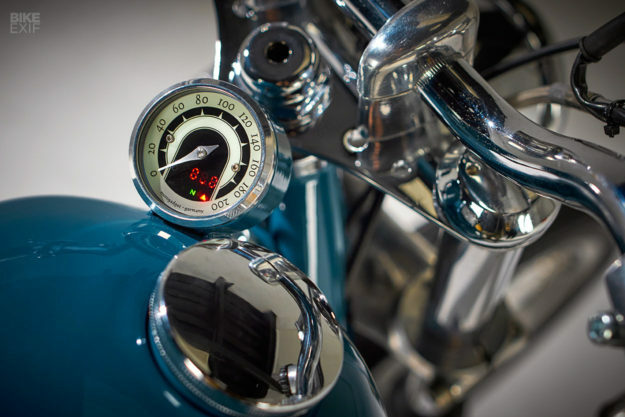 He also installed a speedo and switches from Motogadget, with all the switchgear wiring routed to inside the handlebars. 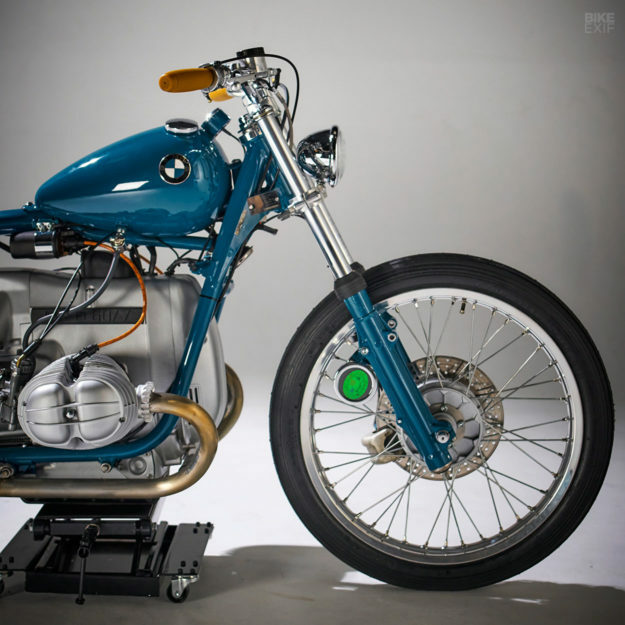 The battery’s been swapped for a smaller Lithium-ion unit, tucked away in a hand-made box below the swing arm pivot. The speedo mount is especially interesting—it’s been welded to the front of the fuel tank, rather than bolted in. As for the tank itself, it’s a 8.5 liter (2.2 gallon) aftermarket item designed for Harleys, which Carlos adapted to fit the BMW. 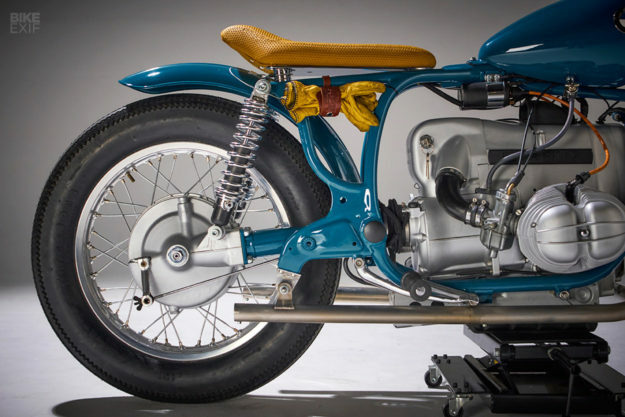 Just behind the tank is a gorgeous custom-made seat, upholstered in a dimpled fabric matched to the grips. The subframe underneath has been modified, but not with the usual cut-n-loop design that we’re used to seeing. There’s a new rear fender too, tucked in close to the frame. The boxer’s stance has been tweaked substantially: Carlos has installed a 21” wheel up front, and an 18” out back, lacing new rims to the stock hubs. He left the brakes mostly original, just upgrading the front with a classic Brembo brake master cylinder from a Ducati Desmo 500. The front forks are stock, but refurbished and shortened. A set of Showa shocks from a Yamaha XJ650 prop up the rear, adjustable for preload and rebound. The rest of the trimmings are as tasteful as they come. There’s the small chromed headlight, the laid-back bars, and small details like the color-coded spark plug leads. 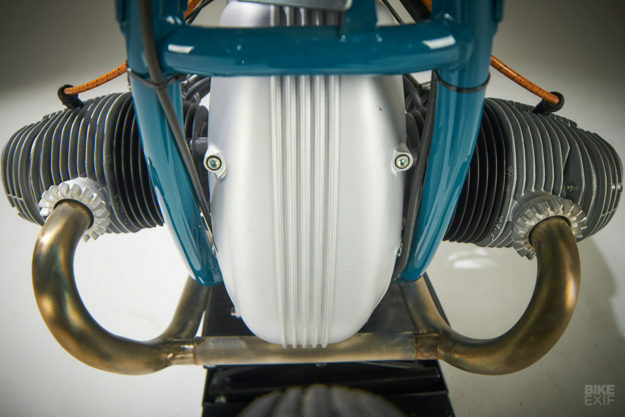 For the exhaust, Carlos added stainless steel pipes to the stock headers, with hidden baffles inside. 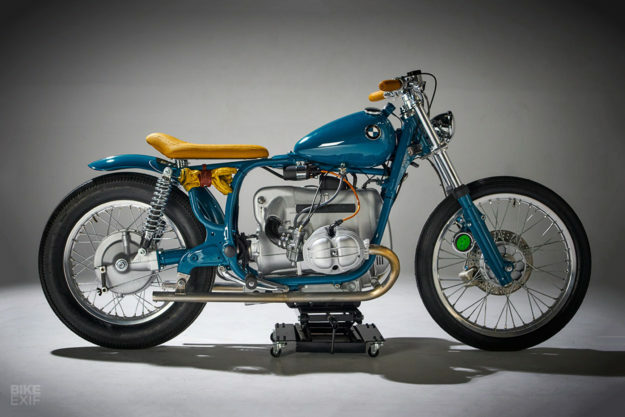 For the color, he picked a classic blue hue from the 50s—common on old Fords or Volkswagens. A set of gloves in a leather glove latch offer up a final touch, courtesy of Carlos’ friend Jose, at Indomable. Look even closer, and you’ll also spot the neat little ‘VA’ logos on the engine badges. 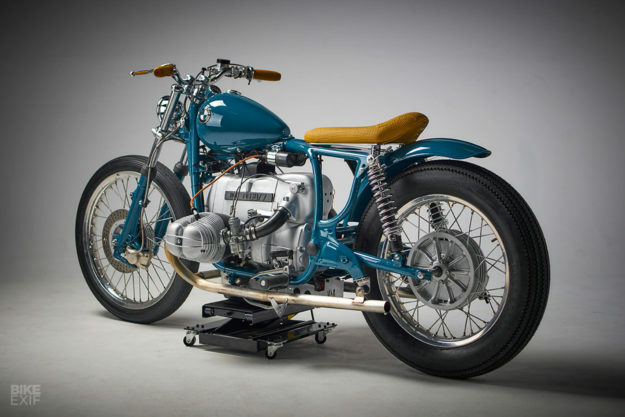 Carlos’ R60/7 is a welcome break from the onslaught of copycat Beemers—and a bike we’d pick ourselves for lazy Sunday cruises. Bravo, Vintage Addiction!